Welcome to A10 Talk’s Preseason Top 25 Player Countdown for the 2017-18 season. Each day, we’ll be publishing a new article, counting down our best 25 players for the coming season. Today, we feature #22 Khwan Fore of Richmond. Originally a 2014 commit out of Huntsville, Alabama, Fore earned a medical redshirt during his true freshman year due to a serious foot injury sustained early on into the season. Fore transformed the injury into an opportunity to grow and mature, as the 6-foot guard performed beyond his years once he hit the court healthy in 2015-16. The Huntsville native averaged 6.5 points and 3.1 rebounds on 51.9 percent shooting during his first full collegiate season, warranting Atlantic 10 All-Freshman Team honors. While the guard’s return season from injury was impressive, Fore made an ever more remarkable jump from his first full playing season to the next: Fore played 33.8 minutes a game for coach Chris Mooney during his redshirt sophomore season, averaging 11.8 points per contest coupled with 4.2 rebounds, 2.5 assists and 1.5 steals per game, all while maintaining a supreme level of efficiency (.507 shooting from the field). Fore’s .507 field goal percentage ranked second in Division I basketball for players 6-feet or shorter with at least 200 attempts, directly behind Stetson’s Divine Miles (.508). The guard will need to augment his highly effective game from the floor that he exhibited last season if the Spiders are to remain legitimate following T.J. Cline’s graduation. 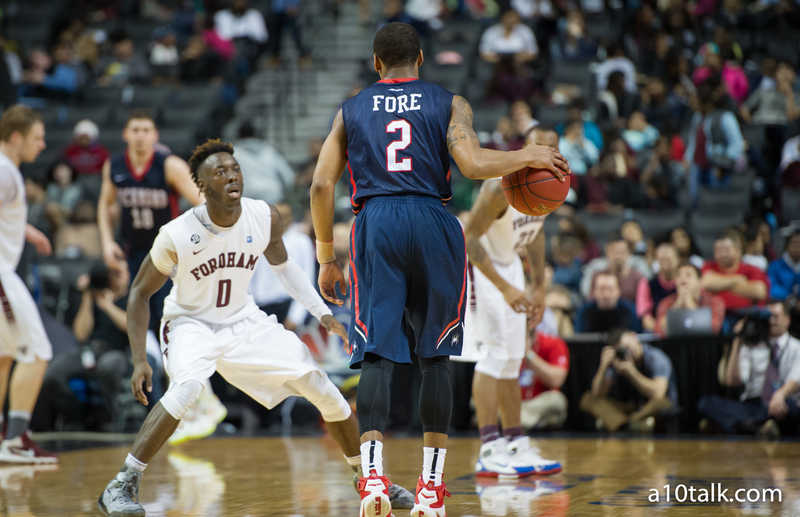 Considering Fore was one of three Richmond players to start all of the team’s contests last season – one being Cline – the Spiders figure to rely heavily upon the mature play of Fore in the backcourt if they’re to remain atop the conference following the departure of such a key player. “With T.J. gone, I do feel [that I need to become more of a leader this season], and that’s one aspect of my game that I’m working on and getting better at,” Fore said. As Fore’s usage rate figures to increase exponentially once more this season, the key to success may be to maintain a high level of productivity while he is on the court. Fore played 33.8 minutes per game last season, as opposed to 20.4 his redshirt freshman year. That number figures to increase once more this year. Potential areas of improvement that Fore should focus on prior to the beginning of the season include improving (or, at least maintaining) a solid 1.387 assist-to-turnover ratio, and improving shooting percentages from the free throw line and from downtown. Fore only shot .615 from the charity stripe and .333 from long range last season – Not necessarily poor statistics, but certainly worthy of monitoring as the guard’s usage rating will inevitably increase. “I feel like the past two years, guys have gotten better with mentoring each other. I feel like even though we’re young this year, we have guys that have a pretty good sense of the game and how we play, as well as what their [own] strengths are. As long as we stay focused the way we are now and continue to get better individually and as a team, I know we can do something big,” an optimistic Fore said. While Fore’s efficiency may decline this season due to more demand, expect for the guard’s statistics to make another round of incremental improvements this season. What may matter the most for the Spiders is whether Fore can begin to act as a leader for a team only sporting two players in their final seasons of eligibility. As a redshirt junior on a team full of underclassmen, Fore figures to be a key cog in the Richmond machine this coming season – both with the ball in his hands and in the locker room.